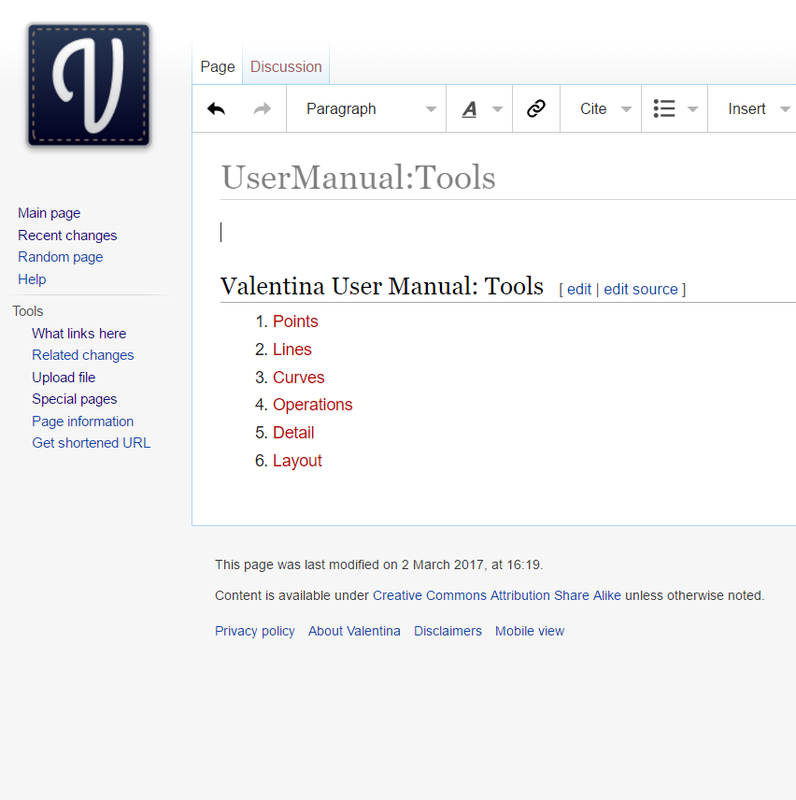 I created a page on the Wiki so that everyone can add their knowledge about how Valentina tools work. Thank you very much @slpencer, I’m really new to wiki and I was battling to do that. I’ll have to create my pictures again and upload them. I already started with that, but work got in the way, so I shelved it for this weekend. 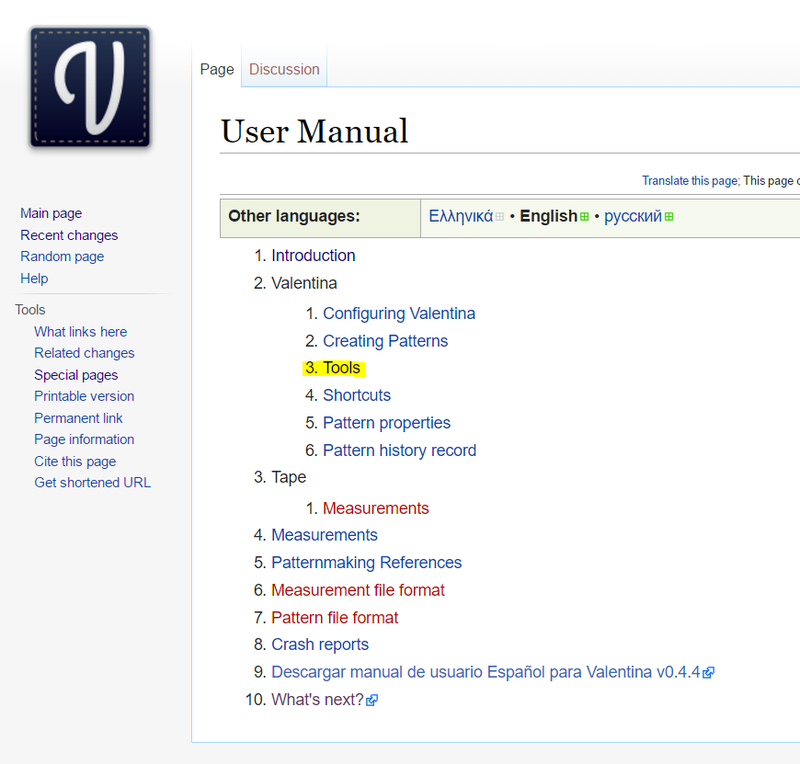 @Grace If you click on ‘edit source’ on any Valentina page, it will show you the markdown language used. It’s super simple (after you get used to it!) Also, while editing, you can highlight text then click on the formatting menubar icons then click preview to check your work before making the changes permanent. Bleh! How do I delete everything I did before, including the images, and start again? I don’t see your changes. Thank you. I managed to edit them. 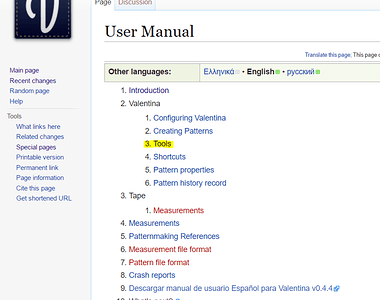 I’m about to try to link the page to the “Tools” section. If the way I’ve done the points is acceptable, please let me know & I’ll start on the Lines. @fabrice - Open a new topic under Patterns category, and post your file! May we post it on the wiki? May we distribute it with Valentina? Hi @fabrice, may I use a screenshot of your document at the end of my curves tutorial, please? @slpencer @Grace Yes you can! Please, I need a little help. I’m trying to understand exactly how the arcs work so that I can do the arcs for the wiki and I’m totally stuck. I’ve added the .val file that I’m using. There are no measurements attached to this file. Ok, I got it right by flipping it, but would still like to know the correct method for the wiki, please. Sometimes its just a matter of re-organizing the objects so that they match desktop algebra/trig. Added Line_B_E & Line_B_C, both originate at the Arc center.